Medellin partially banned motorized traffic and reduced economic activity on Wednesday “to protect citizens” from pollution that has made air “harmful” for people’s health. The red alert that was issued bans more than half of the city’s cars and physical activity for children in schools. Businesses that have failed to adhere to environmental regulations were ordered to immediately stop operations. The state of alert is the second in two years and occurred only weeks after the city government announced it had closed a pact with the private sector to reduce air pollution. The restrictions on traffic, industry and school activities will remain in place at least until Friday, local authorities said. The measures can be extended if the air quality has not improved by then. The exhausts of cars and factories have reduced air quality to the point it is considered harmful, especially for elderly citizens and children. A rapid increase in car ownership in the fast-developing city of 2.5 million has led to excessive pollution. According to transit authorities, one in every three cars in Medellin does not comply with environmental regulations. Gasoline and diesel provided by state-run oil company Ecopetrol contain excessive levels of harmful chemicals, like sulfur, that would make the fuel illegal in developed economies like the United States and the European Union. The city’s geographical location — Medellin lies in a valley — does not allow the exhausts of cars and factories to blow away. This is particularly an issue in March, a month in which there is hardly any wind or rain because of the dry season. 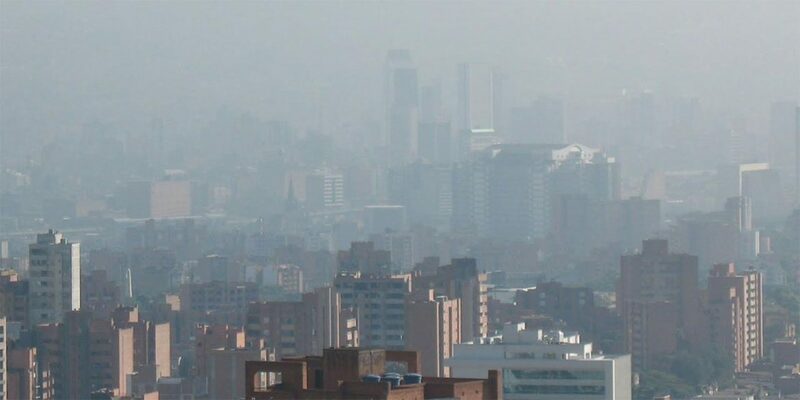 Medellin mayor Federico Gutierrez announced in February that the city’s administration and private sector had agreed to measures that would curb the deterioration of air quality. Environmental activists, however, have said the pact was “superficial” and fails to tackle the primary causes of pollution, low-quality fuel and an outdated fleet of privately-owned buses. Ecopetrol has refused to sign this pact, arguing that its fuel quality is higher than demanded by government regulators. Is Colombia’s oil company Ecopetrol killing citizens for profit? Local transport companies have also refused to take part as they would have to cover the cost of filtering Ecopetrol’s notoriously bad fuel. If the national government were to impose norms similar to those in the US, sulfur levels could drop to 5% of what they are now. Congress, however, is busy with elections. The national government has less than six months left in office.